Founded in San Francisco in 1979, The Sisters of Perpetual Indulgence is an iconic charity, protest, and street performance organization that uses drag and religious imagery to call attention to sexual intolerance and satirizes issues of gender and morality. The fourteen original nuns habits of the Sisters were made in 1980. They were designed by Sister Hysterectoria. The wimple (headpiece), with its distinctive ear brassieres, as the Sisters call them, is based on ancient habits used by Flemish nuns. 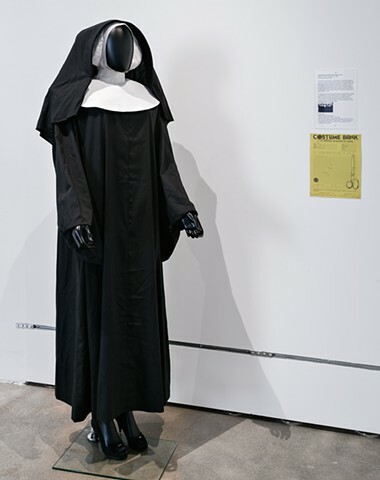 For a cost of $10 each, the original habits were tailored for the Sisters by Charlie Sullivan of the Neighborhood Arts Programs Costume Bank. The Costume Bank was located in the Western Addition Cultural Center, which later became the African American Arts and Culture Complex. This habit belongs to Sister Mary Media, who has owned and used it since it was made.